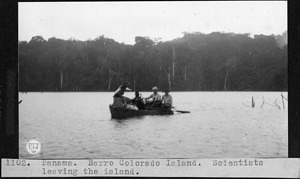 The Smithsonian Tropical Research Institute in Panama was founded in 1923 as the Barro Colorado Island Laboratory to study tropical biology. In 1946, it was placed under Smithsonian aegis as the Canal Zone Biological Area. Although still based in Panama, today its researchers study biodiversity and human culture throughout the tropics. 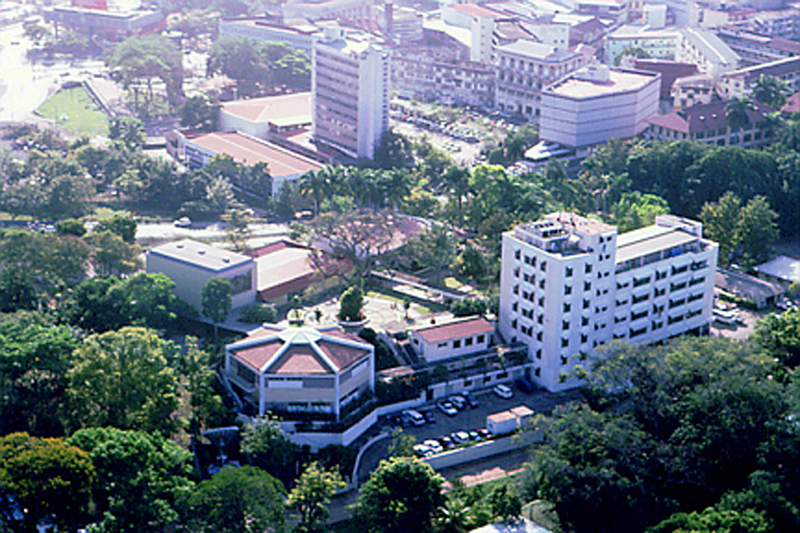 Aerial view of the Earl S. Tupper Center, headquarters for the Smithsonian Tropical Research Institute in Panama City, Panama. 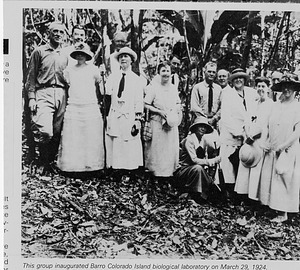 At the inauguration of the Barro Colorado Island Biological Laboratory, this first group of scientists and guests visit the nature preserve and biological laboratory established on Barro Colorado Island. BCI was created when the Chagras River was dammed to create Gatun Lake as a watershed for the Panama Canal. The mountaintop island was set aside as a preserve for visiting North American naturalists. It was funded by a consortium until 1946 when the Canal Zone Biological Area, later (1966) renamed Smithsonian Tropical Research Institute, was transferred to the Smithsonian. 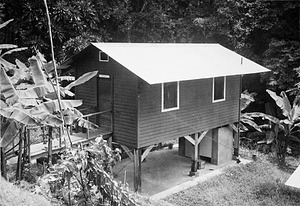 One of the houses for staff of the Canal Zone Biological Area, now the Smithsonian Tropical Research Institute, on Barro Colorado Island, Panama. 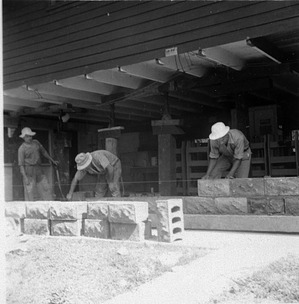 Three unidentified construction workers at the Canal Zone Biological Area located on Barro Colorado Island (BCI) are reconstructing the main laboratory using concrete blocks for the siding and for posts. The building was raised about 6 inches to make it more convernient for taller people. BCI was created when the Chagras River was dammed to create Gatun Lake as a watershed for the Panama Canal. The mountaintop island was set aside as a preserve for visiting North American naturalists. It was funded by a consortium until 1946 when the Canal Zone Biological Area was transferred to the Smithsonian and later renamed the Smithsonian Tropical Research Institute. 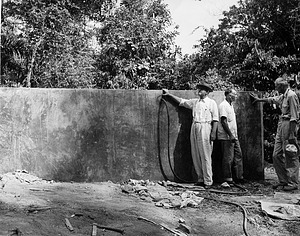 James Zetek, director of the Canal Zone Biological Area, Francisco "Chi Chi" Vitola, chief of the labor force, and Smithsonian Secretary Alexander Wetmore standing in front of construction of a new water tank on Barro Colorado Island in the Panama Canal watershed. The CZBA is now the Smithsonian Tropical Research Institute. 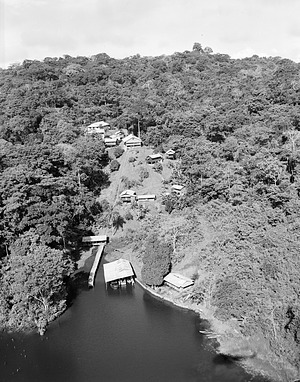 Aerial view of the Barro Colorado Island laboratory of the Canal Zone Biological Area located on Gatun Lake in the Panama Canal watershed in Panama. The CZBA was made part of the Smithsonian in 1946 and later renamed the Smithsonian Tropical Research Institute. This view shows the dock and facilities from Gatun Lake. 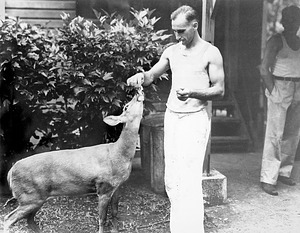 Francisco "Chi Chi" Vitola, chief of labor force on for the Canal Zone Biological Area (CZBA), feeds a deer on Barro Colorado Island in the Panama Canal Zone. The CZBA was transferred to the Smithsonian in 1924 and in 1946 was renamed the Smithsonian Tropical Research Institute. 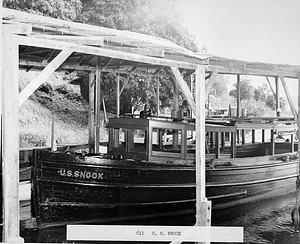 The "U.S. Snook" of the Canal Zone Biological Area, now known as the Smithsonian Tropical Research Institute, ferried staff and supplies from the main land to the tropical field station located on Barro Colorado Island, Gutan Lake, Panama. 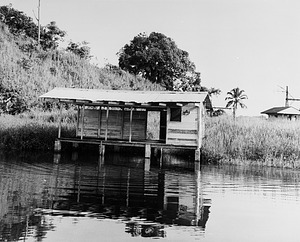 Staff of the Smithsonian Tropical Research Institute took a train from Panama City to Frijoles and left from this dock at Frijoles in the Panama Canal Zone to travel by boat to Barro Colorado Island to conduct research of the flora and fauna of tropical America. 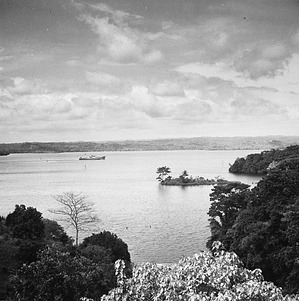 Looking down from the Main Laboratory on the mountain top of Barro Colorado Island (BCI) Biological Area, now known as the Smithsonian Tropical Research Institute, to a ship travelling through Gatun Lake, created when the Chagras River was dammed to create a watershed for the Panama Canal. Slothia Island can be seen in front of BCI; the town of Frijoles is visible in the distance. Tree tops can be seen in the water when the Chagres River was dammed and flooded the area. 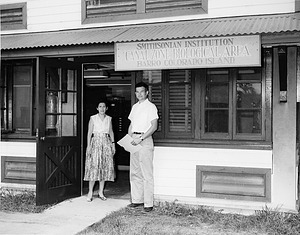 Adela Gomez, administrative officer, and Carl Koford, director, of the Canal Zone Biological Area (CZBA), now the Smithsonian Tropical Research Institute, during Koford's brief tenure as director during the 1950s. They are standing in front of their new office at 5145 Diablo Heights, Canal Zone, under a sign for the CZBA. 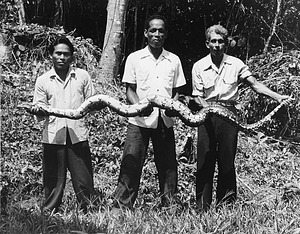 Three staff members of the Smithsonian Tropical Research Institute holding a large snake on Barro Colorado Island. Fausto Bocanegra is in the center. Bocanegra was the assistant to the director, taking care of animals under ethological study. 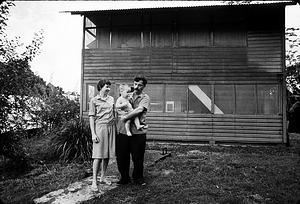 Biologist A. Stanley Rand, wife Patricia Rand, and son Hugh, on Barro Colorado Island, Smithsonian Tropical Research Institute, Panama. The Rands lived on the island. 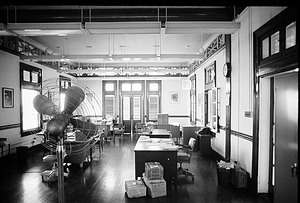 Administrative offices of the Smithsonian Tropical Research Institute, Ancon Building, Panama City, December 1965. Housed in the old Ancon courthouse building, the Panama City office provided administrative and logistical support to the scientists conducting research on Barro Colorado Island located in Gatun Lake in the Panama Canal watershed. 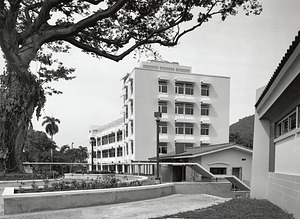 This tropical laboratory, called the Canal Zone Biological Area (CZBA), and later renamed the Smithsonian Tropical Research Institute (STRI), was transferred to the Smithsonian in 1946. 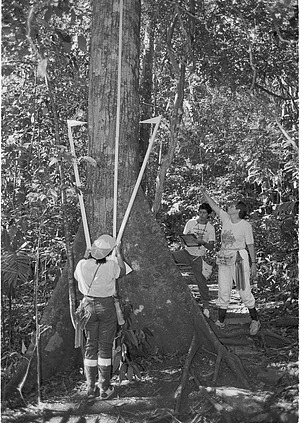 A project participant uses calipers to measure a tree on Barro Colorado Island during Smithsonian Tropical Research Institute census, similar to the one in Malaysia, on the biological diversity of tropical rain forests. A Corotu tree, left, towers near the entrance to the Earl Silas Tupper Research and Conference Center, completed in 1989, at the Smithsonian Tropical Research Institute (STRI), Panama City, Panama. The Center is used by STRI scientists and visiting researchers from around the world.